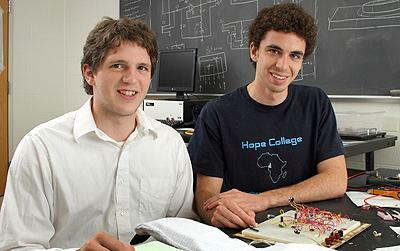 Ryan Core and Scott Brandonisio, who are junior engineering students at Hope and were participants in the Hope Entrepreneurship Initiative (HEI) 2011 Summer Fellowship Program, are among the select number of young entrepreneurs competing this week in the student component of the Accelerate Michigan Innovation Competition, billed as the world's largest business competition. Core's and Brandonisio's company, CS Industries LLC, has been developing an extremely comfortable light and sound-cancelling headband as a sleeping device, with a variety of applications. The Accelerate Michigan Innovation Competition is being held in Ypsilanti, and started on Tuesday of this week and is continuing through Thursday, when Brandonisio will present CS Industries' concept. The competition targets mid-to-late-stage business start-ups with potential to generate an immediate impact on Michigan's economy, as well as student concepts with longer-term business viability. In last year's Accelerate Michigan student competition, there were 10 student finalists, with first-, second- and third-place prizes awarded and a "People's Choice" winner announced as well. Top prize for the student portion of the event is $25,000. Core, of Hammond, Wis., and Brandonisio, of Troy, were supported in developing their product and business plan, including through the use of laboratory space on campus and guidance from the program's entrepreneur-in-residence and other activities organized for program participants, through the college's 10-week HEI Summer Fellowship Program this past summer. Hope students from all majors are eligible to apply to the HEI Summer Fellowship Program, with selection criteria including presentation of their idea to a review team. Additional information about Core's and Brandonisio's product, as well as about the HEI experience, is available online.